Taylor performing with Queen + Paul Rodgers in Vienna, 2008. Roger Meddows Taylor (born 26 July 1949) is an English musician, best known as the drummer for the rock band Queen. As well as a multi-instrumentalist, he is also a singer and songwriter. As a drummer, Taylor was recognised early in his career for his unique sound. He has since been acclaimed by the Foo Fighters drummer Taylor Hawkins as one of the most influential rock drummers of the 1970s and 1980s, as well as being voted by radio listeners as the eighth-greatest drummer in classic rock music history in a poll conducted by Planet Rock in 2005. As a songwriter, Taylor contributed songs to Queen's albums from the very beginning, composing at least one track on every album, and often singing lead vocals on his own compositions. He wrote or co-wrote three UK number 1s ("These Are the Days of Our Lives", "Innuendo" and "Under Pressure") and contributed a further five major hits ("Radio Ga Ga", "A Kind of Magic", "Heaven for Everyone", "Breakthru", and "The Invisible Man"). He is also commonly known to have been the main writer on the international top-ten hit "One Vision", although the track is credited to the whole band. He has collaborated with such artists as Eric Clapton, Roger Waters, Roger Daltrey, Robert Plant, Phil Collins, Genesis, Jimmy Nail, Elton John, Gary Numan, Shakin' Stevens, Foo Fighters, Al Stewart, Steve Vai, Yoshiki, Cyndi Almouzni, and Bon Jovi. As a producer, he has produced albums by Virginia Wolf, Jimmy Nail and Magnum. In addition to his drum work, Taylor sometimes played keyboards, guitars and bass on his own songs. During the 1980s, in addition to his work with Queen, he formed a parallel band known as The Cross, in which he was the lead singer and rhythm guitarist. During the early 1980s, Taylor was also a panelist on the popular UK quiz show Pop Quiz, hosted by Mike Read. According to The Sunday Times Rich List, Taylor was worth £80 million or around $127 million as of 2011. In 2014, he appeared in The Life of Rock with Brian Pern as himself. Taylor is also well known for his falsetto vocal range. Roger Taylor was born in the West Norfolk & Lynn Hospital, Exton's Road King's Lynn, Norfolk, on 26 July 1949. The new maternity ward was opened by the (then) future Queen Elizabeth II where she was introduced to 16 new mothers including Mrs. Winifred Taylor, his mother. Taylor first lived at 87 High Street in King's Lynn, but later moved to Beulah Street in the town. Taylor's first school was Rosebury Avenue school. Taylor moved to Truro, Cornwall, south west England, with his mother Winifred, father Michael and younger sister Clare. When he was seven years old, he and some friends formed his first band, the Bubblingover Boys, in which he played the ukulele. He briefly attended Truro Cathedral School; then, at the age of 13, he joined Truro School as a day boy. At the age of 15, Taylor became a member of the Reaction, a very busy semi-pro rock band formed mainly of boys from Truro School. Taylor had originally learned guitar, but became a drummer when he realised he had a more natural aptitude for it. Taylor taught himself to tune his drums, inspired by Keith Moon of The Who because of the "great drums sounds" on the early Who records. Another key influence on Taylor was drummer Mitch Mitchell of The Jimi Hendrix Experience, who Taylor stated was his early role model. In 1967, Taylor went to London to study dentistry at the London Hospital Medical College, but he soon became bored with dentistry and soon changed to Biology and obtained a BSc at East London Polytechnic. "Father to Son" – Queen II (1974) (This contains his highest range ever recorded, from G4 to A5). Taylor's next venture, Strange Frontier, came in July 1984. The three singles from the album were the title track, "Beautiful Dreams" (in Portugal only) and "Man on Fire", the latter becoming a live favourite for him in later years. No attempts to promote the singles were made since Queen toured to promote The Works, and Taylor did not perform on any TV shows. Strange Frontier included guest appearances by bandmates Freddie Mercury, Brian May and John Deacon. Mercury sang backing vocals on "Killing Time", Deacon remixed the B-side "I Cry For You" and Rick Parfitt co-wrote and played on "It's An Illusion". David Richards, Queen's engineer and producer at the time, also co-wrote two of the tracks. The album includes covers of Bruce Springsteen's "Racing in the Street" and Bob Dylan's "Masters of War". After Queen finished their 1986 Magic Tour, Taylor started a new band, The Cross, which released three albums over their six years of existence. In 1993 the band split up, after performing one final gig at the Gosport Festival. In 1994, Taylor worked with Yoshiki, drummer and pianist of X Japan and released the song "Foreign Sand" and a reworking of The Cross's "Final Destination". The album Happiness? was "Dedicated to the tasmanian tiger – thylacinus cynocephalus, but most especially... for Freddie". "Nazis 1994" from this album became Taylor's first hit single in England and was followed by two other top 40 UK hits, "Happiness" and "Foreign Sand." The album is called, Fun on Earth', and was released on 11 November 2013. The first album, Shove It, was released in 1988. In Europe, Heaven for Everyone (later a Queen song) contained Freddie Mercury on lead vocals and Taylor on backing vocals. However, on the single version and American album version the roles were switched. The European CD contained an extra track (compared to cassette and LP) in The 2nd Shelf Mix, the US version having "Feel The Force" as its extra track. 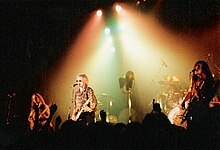 The band promoted hard (especially in Germany), with many TV performances of singles including an appearance at the Montreux Golden Rose festival in 1988. The tour took in dates in the UK and Germany. Three singles were released from the album: "Cowboys and Indians", "Heaven for Everyone" and "Shove It". Another single, "Manipulator," was released in 1988, but it was not included on any album. It was also the only song from the time that had joint writing credits, Taylor sharing them with Edney and Steve Strange. After finishing Queen's 1989 album The Miracle, Taylor went into the studio with the rest of The Cross for the first time to record Mad, Bad and Dangerous to Know. The band composed the opening track "On Top of the World Ma" with a riff bearing a resemblance to the Led Zeppelin track Whole Lotta Love. The rest of the album consisted mainly of individually written songs, except for "Power To Love" which was the result of the combined effort of Macrae, Noone and Moss. Clayton Moss sang lead vocals on his own track "Better Things", and Spike Edney played mandolin on "Final Destination", which was written by Taylor. "Final Destination" was released as a single, as were "Liar" and "Power To Love", the latter being the last single to be released in the UK by the band. "Final Destination" came with a live rendition of Taylor's song "Man on Fire" as a B-side, and "Liar" (Noone) had a brand new track, "In Charge of My Heart", which was also penned by Taylor. The 12" single and CD of "Liar" also included extended remixes of both "Liar" and "In Charge of My Heart". The instrumental section at the beginning of "In Charge of My Heart" was used as the opening to concerts on the accompanying tour. "Closer To You" (Edney) had been planned to be released in America, but never was. The group having seemingly given up on the UK market, the accompanying tour only included dates in Germany, Austria, Switzerland and Ibiza. Unusual for such tours, every song from the new album was played live. 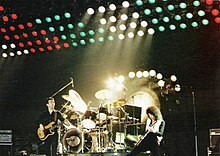 Made at a time when Taylor's efforts were concentrated on Queen and Mercury himself, Blue Rock gave the other members of the band a chance to take control of the upcoming album. It was in fact mostly written by Edney, who contributed three of his own tracks and contributed to four more. Once again the opening track was penned by the entire band, "Bad Attitude" was written (although not complete) by the Christmas fan club party of 1990. The album itself contained a lot of vocals not from Taylor, but mainly of Edney and Noone. Examples of this can be heard in "Put It All Down To Love" (Edney), "Life Changes" (Moss, Noone, Edney and Macrae) and "Heartland" (The B-side to Life Changes, penned by Noone). Blue Rock itself was only released in Germany (although promo copies were released in Italy and Japan), so copies are somewhat rare. "New Dark Ages" (Taylor) was released in Germany with another live version of "Man on Fire", whilst "Life Changes" was released with the B-side "Heartland". It was however immediately withdrawn due to Freddie Mercury's death. The tour was in support of Magnum, so the concert lengths were short (45 mins.) and very few bootlegs have survived. The tour pace was rapid, covering 20 dates in one month. Taylor has appeared along with Brian May for various other events and promotions, including Queen's 2001 induction into the Rock and Roll Hall of Fame. and the "Party at the Palace" in 2002, celebrating the golden jubilee of Queen Elizabeth II. In 2004, Taylor, Brian May, and Mike Dixon received the Helpmann Award for Best Music Direction for the musical 'We Will Rock You. Taylor and May, performing as Queen, also appeared three times on the American singing contest television show American Idol, once on 11 April 2006, during which week contestants were required to sing a Queen song, (which included "Bohemian Rhapsody", "Fat Bottomed Girls", "The Show Must Go On", "Who Wants to Live Forever", and "Innuendo"), a second time on the show's season 8 finale in May 2009, performing "We Are the Champions" with finalists Adam Lambert and Kris Allen, and a third time on the eleventh season on 25 and 26 April 2012, performing a Queen medley with the six finalists on the first show, and the following day performed "Somebody to Love" with the 'Queen Extravaganza' band. At Live Earth in 2007, Taylor opened the concert with Taylor Hawkins of the Foo Fighters and Chad Smith of Red Hot Chili Peppers. In November 2009, Taylor appeared on the popular reality TV show The X Factor with May as Queen mentoring the contestants, then later performing "Bohemian Rhapsody". Also in that month, Taylor confirmed he is planning to tour with Taylor Hawkins, which Taylor described as a "quick tour". At the 2011 MTV Europe Music Awards on 6 November, Queen received the Global Icon Award, and Taylor and Brian May closed the awards ceremony, with Adam Lambert on vocals, performing "The Show Must Go On", "We Will Rock You" and "We Are the Champions". On 15 November 2014, Taylor joined the charity group Band Aid 30, playing drums alongside current British and Irish pop acts on the latest version of the track "Do They Know It's Christmas?" at Sarm West Studios in Notting Hill, London, to raise money for the 2014 Ebola crisis in Western Africa. On 5 and 6 September 2015, Taylor, along with Led Zeppelin's John Paul Jones, joined Foo Fighters on stage in Milton Keynes to perform a cover of the Queen and David Bowie song "Under Pressure." By the time News of the World was released in 1977, Taylor had met his future girlfriend, Dominique Beyrand. She had been working for Richard Branson at the time, who was at the helm of Queen's free concert at Hyde Park. They lived together from 1980 to 1987, raising their two children: Felix Luther, who would release the single "Woman You're So Beautiful" with his father under "Felix & Arty" in 2006, and Rory Eleanor. In January 1988, although the couple's relationship had broken down, Beyrand and Taylor decided to marry in order to protect their children's interests in the future. At the time, Taylor was seeing another woman, Debbie Leng (seen in the "Breakthru" video); whom he moved in with a month after his marriage of convenience to Dominique. Before Freddie Mercury's death, Taylor and Leng had their first child, Rufus Tiger, born in March 1991, also a drummer for The Darkness and a touring musician for Queen + Adam Lambert. The couple went on to have two more children; Tiger Lily (1994) and Lola Daisy May (2000), before separating in late 2002. Taylor remarried on 26 August 2010, to his partner of six years Sarina Potgieter. Taylor resides in Puttenham, Surrey. A new species of the genus Heteragrion (Odonata : Zygoptera) from Brazil was named Heteragrion rogertaylori in honour of him, with the etymology: "I name this species after Roger Taylor, drummer and songwriter, whose powerful sound, wonderful lyrics and raspy voice have enchanted the world for over four decades." In 2002, Taylor appeared on the "Twelve Drummers Drumming" Christmas card in the "Twelve Days of Christmas" set sold at Woolworths to raise money for the NSPCC – alongside the "other" Roger Taylor, the drummer for Duran Duran. ^ Macnab, Geoffrey. "Roger Taylor interview: The Queen drummer has written the soundtrack for British film Solitary". Independent. Retrieved 6 October 2016. ^ "Taylor Hawkins: Rhythm 2002". Fooarchive.com. Retrieved 2014-07-16. ^ "Zeppelin voted 'ideal supergroup'". BBC News. 10 July 2005. Retrieved 28 January 2008. ^ "These Are the Days of Our Lives". Bechstein Debauchery. Archived from the original on 17 December 2007. Retrieved 28 January 2008. ^ "The Invisible Man". Bechstein Debauchery. Archived from the original on 17 December 2007. Retrieved 28 January 2008. ^ Tara Evans (4 May 2011). "Sunday Times music rich list: top 50 richest people in music". Thisismoney.co.uk. Retrieved 2014-07-16. ^ Trevor, Heaton. "Rock Star's Norfolk Childhood". Queen Archives. Eastern Daily Press. ^ "Roger". themarchoftheblackqueen.piczo.com. Retrieved 8 April 2012. ^ a b "Roger Taylor Interview". Queen Zone. Retrieved 10 August 2015. ^ a b c d "Roger's Drum Master Class (Music Works - BBC World Service, November 28, 1993)". Queen Online. Retrieved 10 August 2015. ^ "Roger Taylor". Queen official website. Retrieved 2017-01-15. ^ Rose, Frank. "Heavy Meddows Kid". Queen Archives. Eastern Daily Press. ^  Archived 8 February 2007 at the Wayback Machine. ^ Patrick Lemieux; Adam Unger (2013). The Queen Chronology: The Recording & Release History of the Band. Across the Board Books. p. 54. ISBN 978-0991984046. ^  Archived 30 September 2007 at the Wayback Machine. ^ "QueenOnline – News". 17 November 2009. Retrieved 1 December 2009. ^ "Roger Taylor To Release Solo Album | Rock News | News". Planet Rock. 22 November 2012. Retrieved 2013-06-27. ^ "Queen: inducted in 2001 | The Rock and Roll Hall of Fame and Museum". Rockhall.com. 15 April 2013. Retrieved 2014-07-16. ^ "Party at the Palace". QueenVault.com. 3 June 2002. Retrieved 2014-07-16. ^ "Past nominees and winners Helpmann Awards". Retrieved 16 December 2016. ^ "'Somebody to Love' on 'American Idol' – Video". Rolling Stone. 27 April 2012. Retrieved 2014-07-16. ^ "Queen And Foo Fighters Drummers To Team Up For 2010 Tour". Gigwise. 17 November 2009. Retrieved 2014-07-16. ^ Penny Newton (6 November 2011). "Katy And Adam Honour Queen! | Queen | News | MTV Australia". Mtv.com.au. Retrieved 2014-07-16. ^ "Roger Taylor of Queen guest appearances discography.". Rogertaylor.info. Retrieved 29 September 2014. ^ "He will, he will, rock you! Jayce Lewis is granted an audience with Queen star – Wales Online". walesonline. Retrieved 29 September 2014. ^ "Queen drummer Roger Taylor agrees to play on Welsh rocker Jayce Lewis' new album". walesonline. Retrieved 29 September 2014. ^ Katie Nicholl (2 October 2010). "A mighty bash as Queen drummer Roger Taylor ties the knot | Mail Online". Dailymail.co.uk. Retrieved 2014-07-16. ^ Lencioni, F.A.A. (9 July 2013). "Diagnoses and discussion of the group 1 and 2 Brazilian species of Heteragrion, with descriptions of four new species (Odonata: Megapodagrionidae). Zootaxa 3685 (1): 001–080." (PDF). Zootaxa. Magnolia Press - Auckland, New Zealand. Retrieved 26 September 2015. ^ Rohrer, Finlo (14 October 2008). "The politics of stamps". BBC News. Retrieved 29 October 2011. ^ Alex Spence. "Royal Mail unveils Beatles album cover stamps (''Times'' Online)". The Times. UK. Retrieved 29 October 2011. ^  Archived 28 September 2011 at the Wayback Machine.